(Reuters) - Shares in Levi Strauss & Co surged 31 percent in their debut on Thursday, giving the jeans maker a market value of $8.7 billion and suggesting strong investor appetite before much-awaited listings from Lyft and Uber. "I'm not going to live or die by what the stock does day in and day out," Chief Executive and President Chip Bergh said in a telephone interview. "We're here to run the business for the long term. It is humbling that the stock was so well received today. That is pretty awesome." "Denim continues to prove prevalent in streetwear and on the runway, so we're not expecting it to go anywhere anytime soon," an analyst at retail analytics firm Edited said. "That's why now is a great time for Levi's to capitalize on this momentum." Going forward, Bergh also said Levi can double its business in Asia in the next couple of years "and then double it again". 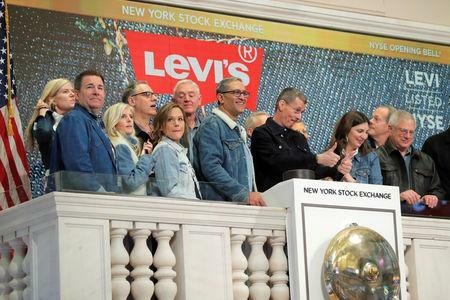 Levi's market splash marks the start of what could be a blockbuster year for IPOs with several high profile companies expected to list their shares. "The market is pretty ripe and we're the first big IPO of the year," he said. "There was a lot of pent-up demand because it's been pretty slow the last couple of months and that was also probably a tail-wind for us." The company's $8.7 billion market capitalization at the start of trading is based on outstanding shares of about 390 million, which includes the over-allotment option. "The company and the underwriters targeted a reasonable valuation to start and allowed the true investor demand to dictate price which ultimately came one dollar above range."